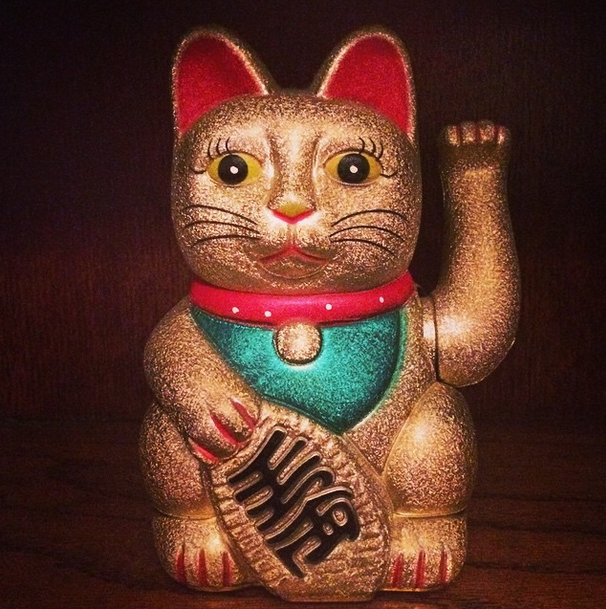 Since I started eating in Red Star on Cowley Road when I was around 22, I have wanted a Golden Cat of Fortune. I've mentioned this to every boyfriend and they've all "intended" to buy me one but have all failed miserably. This is what happens when you date artists who are starting out, they are piss poor broke and would rather spend their money on (one or more of the following): gambling, video games, alcohol, food, Star Wars stuff, drugs, musical instruments, clothes, etc. I knew Rowan could be "the one" when he told me about his alter-ego, Archie Pelago. I then told him about mine, Saffron Challows. The moment I had it confirmed was when I told him about my need for a Golden Cat and how all of my exes had failed, when he told me he had one already.